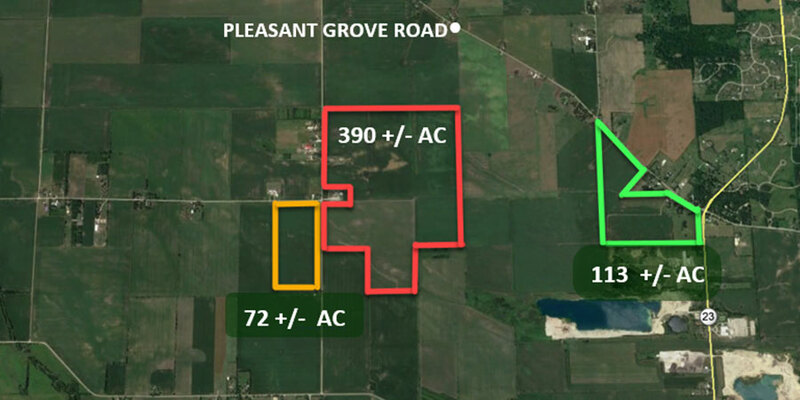 Marengo Farmland | Inland Real Estate Commercial Brokerage, Inc.
577+/- acres of divisible land priced at $14,500 per acre. Annexed to the City of Marengo, McHenry County, including all adjacent unincorporated roads & highways. Initial zoning of Agricultural Transitional is acknowledged as an interim zoning classification pending future development of the property. The land provides multiple access points and the annexation agreement provides great flexibility in the types of land uses that can be developed to include; single/multi-family, commercial, industrial and agriculture. 1.6 miles from proposed I-90 tollway/Route 23 interchange. Located at the signalized corner of Route 23 and Coral Road.